Hi Folks. 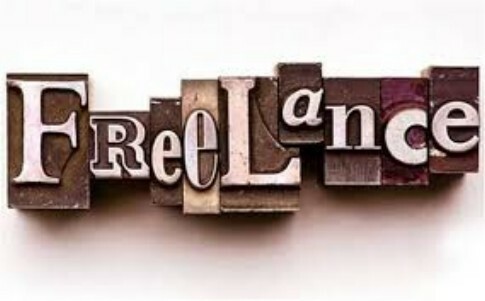 This second blog is one for Freelancing. Freelancing is something you can start making money from home with zero up-front investment. And if you take the time to move beyond writing and master a specialist, in-demand skill you can easily earn 5 figures per month. That’s the good news. The bad news is that the freelance world is fiercely competitive. To give you an idea of just how competitive it is, there are almost 140,000 contractors in the Writing and Translation category on Elance alone. And with intense competition comes a bidding war where contractors tend to work for peanuts. 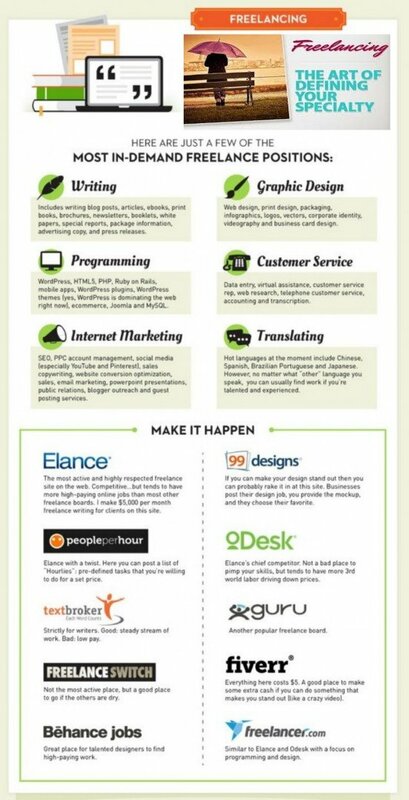 But there are other ways to make money as a Freelancer apart from writing as the graphic shows. So have a browse and see if there’s anything you think you could do. Here’s a link to Mashable - http://mashable.com/2009/03/03/freelance where there are lots of links to tools you can access. If there’s anyone reading this blog who is already actively engaged in freelance work perhaps they can leave a tip or two for their fellow members. Have a great day or evening and you can leave a comment with your own thoughts on this way to earn an income online from the comfort of your living room. Right click the images and choose open in a new Tab to enlarge then one click will enlarge it a wee bit more.. Interesting idea.,Think it will be a bit before I can feel ready but good to have a resource to work with at that time. Thanks Robert for the share. Hello Sami and thank you for your comment. Freelancing is just one of 10's of 1,000's of ways to make money online. I have other blogs in the pipeline where I will be outlining some of them so keep and eye open for them in the coming days/weeks. Will keep the eye open! Actually going to publish it tonight after I get home Sami. I also am involved with freelancing as part and parcel of my online entrepreneurial activities. One benefit of freelancing is that you become exposed to many good ideas that you may otherwise have never learned about. Hello Michael and thank you for your comment. As I said to Juliet - there are a lot of opportunities that people are not aware off. I personally think its because people come into online marketing with the one idea in their head that they have to have something of their own to sell or earn commissions promoting someone else's. As you have found out there is a whole lot more to earning money online than that. Hope you are making a few bucks at it or even a whole pile of bucks. You have a great day and thank you for dropping ny. I love this blog post! I will add one thing in reference to content mills - Odesk, now known as Upwork, is awful. The customer service is terrible as is the process to write. One that I love is outsource.com. You have to pay for it, but it's par for the quality. Olive I think you replied to the wrong blog. Thanks for the visit though. Hello Juliet and thank you for your comment and yes there are a lot of opportunities that people are not aware off. If there's something you fancy doing because you have some knowledge then go for it. After all it will not cost you any money to try so why not. Hello David and thank you for dropping by and for your comment. Did anything catch you eye or get you thinking - "I could do that". Go for it if you have some knowledge about something in particular. I am Popmarco in Fiverr and I have earned the past 8 months an extra $1200 for doing animated explainer videos for students, website owners, teachers and even CEO's who were promoting something or simply trying to relay a message. All of them (except the one who ordered without discussing her requirements with me first) gave me a five-star rating. An because of that, orders kept on piling up that I had to switch the Vacation Mode on so as not to drop my deliverables in my day job. But I would also agree that the competition is really tough. If not because of my work, I'd do everything I can to have something to do everyday. But I'm good with just on a "waiting game". After all, it was only meant to have my investment back when I spent in Powtoon Business account for a company presentation requirement. But anybody can actually make it as long as the clients' requirements of quality, reasonable pricing and fast turn around are addressed. Hi Jojo and well done you. You're proof it can and does work and I'm sure if you spent more time at it you could easily make a reasonable income from your efforts. Giving people what they want will always make you money no matter what it is there are always markets out there. Thank you for your comment and have great day. Great blog. I currently freelance and all I can add is - you are absolutely correct. The competition is fierce online. If I was to give one tip, it is to search for clients in your own back yard. Help LOCAL businesses within driving distance of your own home. There are local businesses that don't have a website or Facebook fan page that you could offer to help. You can negotiate your own fee. If you have a particular niche that you're familiar with, do a Google search in your area Let's say you Google "Dentists in Edinburgh". Visit a few websites. If they have no site, or hteir current site is out of date - an send out an email. "Dear Dennis the Dentist" I am a neighbor of yours and I happened to be online and I notice you're website isn't up to date" I'd like to show you what I can do. Here's a link to a website I built for so and so..."
Or it could be an article or blog. The main take-away is - business could be right around the corner. Go get it! Hello Hal and thank you for dropping by and leaving your great comment. I'm sure that you have given the other readers some food for thought. A lot of people do tend to forget that there is a lot of business locally and if they only just took the time to do a wee bit research as you say there's a pretty good chance that there's good business opportunities on their doorstep. Excellent idea's that you have touched on to wake up our creative side Robert! I like you idea's! And you are so right about every one having something special that no one else has. We just have to get more in touch with our self's and go to work...get it out there to others. Who knows if we don't at least try, that is called believing in our self's. Have a awesome day or evening Robert! 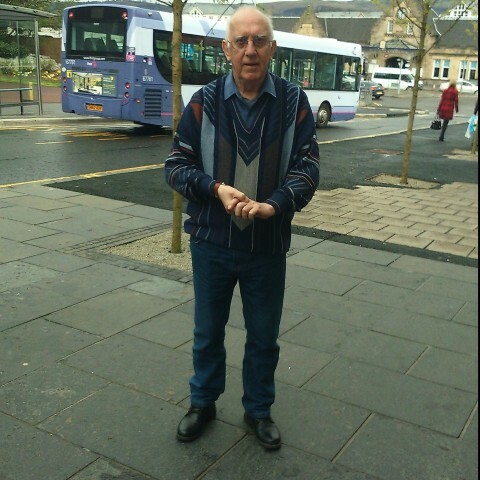 Hello Lind Lu and how are you, getting on with your site, and well I hope. Have you got a creative side Linda or is it something you didn't know you had until you joined WA and started reading my blogs lol. Anyway you get in touch with yourself and come up with some awesome ideas of your own and you will soon be in the money then you can fly over here and I will show you our beautiful city. You wont want to go back that's for sure though i suppose most, if not everyone believes their home city or town is the best. Hello Jennifer and thank you for taking the time to read my blog and for leaving your comment. Hope you went away with an idea or two. Hi Robert. You're so right about the competitiveness of freelance writing. I've looked into a couple of these and, as you said, they want you to work for peanuts! Plus, I was very green when I started exploring this option so I gave up pretty quickly. By the way, Elance is now called Upwork but people can probably still get to it by going to the old link. Thanks for this. You have given me a couple of new ones to look into. I may go back and revisit this now that I have a little more knowledge and skills. Hello Debby and thank you for your comment. I know Elance changed its name but a lot of people still type it in and are re-directed and as you can see Google still allows graphics with the old name. Good you went away with a couple of tips and you must let me know how you get on. Thanks again Robert. Are you going to do another one tomorrow? I'm looking forward to hearing more! You have a great day too, or evening maybe. My next one will be about Blogging Debby which a lot of people don't realize they can make good money from. Not got it finished yet as I still have my other stuff to take care of so probably Friday in nice time for the weekend when everyone's at home. Have a nice day but its late evening here and I will be signing off soon. That's true Robert. I'll be busy playing with the ideas you've already put out there anyway. I'm just excited to learn more about other ways to be successful on line. Do have a nice evening. I will try Debby, I will will certainly try and you too. Hello and thank you for reading my blog and my previous one might interest you as well. Ways To Make Money Online Have a good one. No probs George and you might find something to do as a sideline. Every little helps and even 50 bucks a month will pay your WA subscription. Thank you for the comment and have a nice day.